Still humming along on Tatooine, the DROID 2 R2-D2 edition has not been forgotten. Verizon and Motorola have both approved an update that will introduce a handful of security patches (likely breaking root), bug fixes, better data connectivity, and update VZ-branded apps. While this device will likely never see Ice Cream Sandwich, at least improvements to its current state are still being issued. 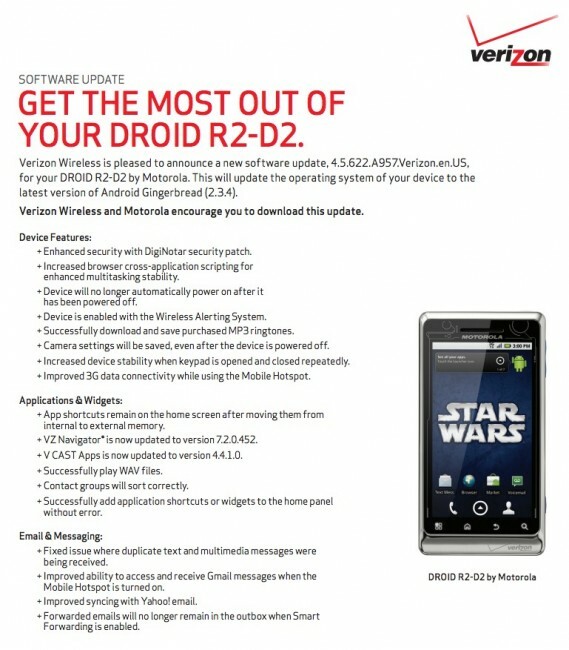 After the update, your R2-D2 device will run Android 2.3.4. When support docs like this show up, an update is usually pushed within a week. More info. The update is 12MB in size.